At the beginning of the week the BBC weather called for a very pleasant Sunday. High 12, light winds and a 10% probability of precipitation. However as the days marched on, that forecast degraded to colder temperatures, higher winds and a 90% POP. When we awoke in our team rooms at the Frontline Club in Paddington, rain was pounding down on the skylights. But it was pageant day and WE HAD A CANOE. We had a canoe. Proof, perhaps, that there is a god. Everything else was detail. Including the weather. 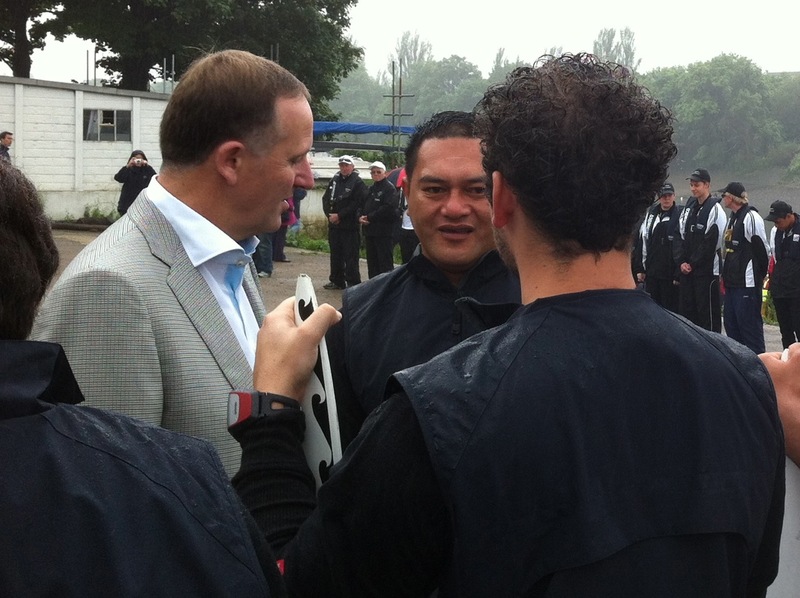 By the time we reassembled the team at the University of London Boat Club, the rain had let up and we were just in time to watch John Key, the Prime Minister of New Zealand, come by to wish his team well. 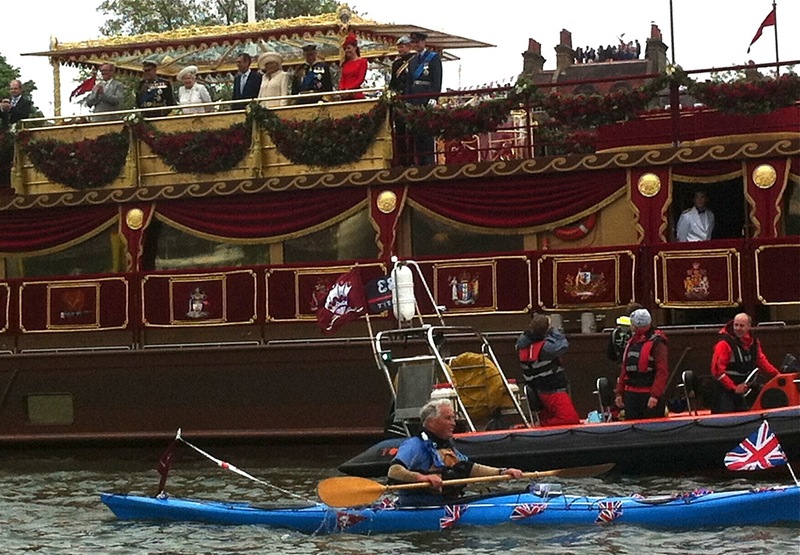 It was neat to watch our new friend, Wakka Canoe Captain, Chappie Harrison, introduce his paddlers one by one to the PM. 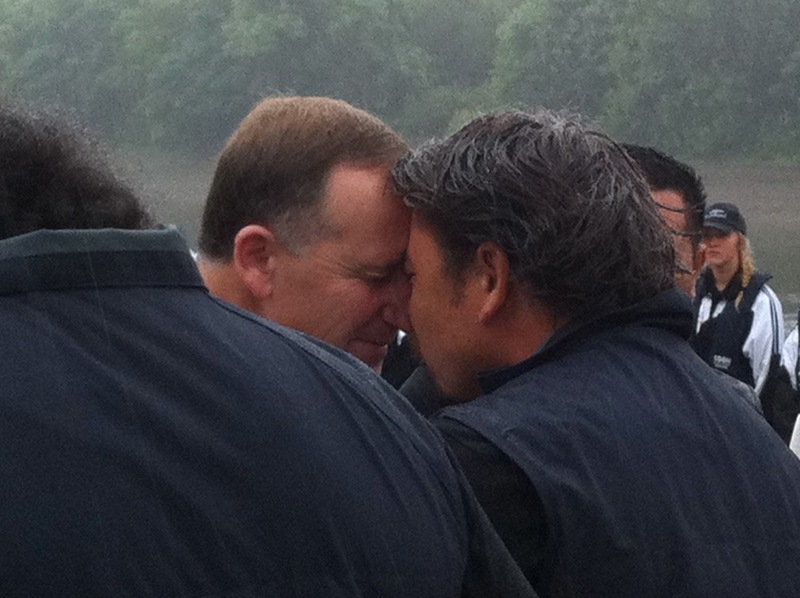 Prime Minister Dey gave a traditional Maori “hongi” greeting, touching nose to nose twice—once for the ancestors, once for the greeting. We were touched when Chappie told his PM about the dual canoe blessing ceremony and the connection that was forming between our team and theirs. 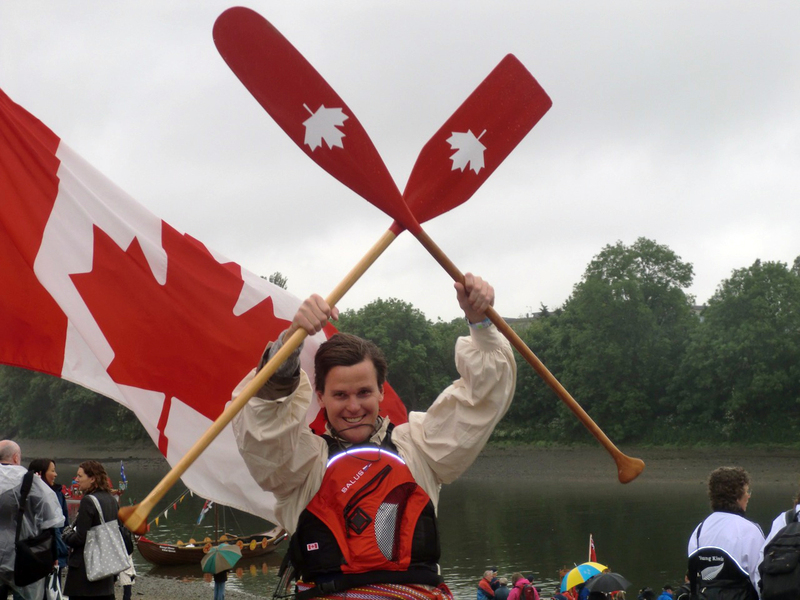 There to see us off was, Dominique Lizé-Beaulieu, the High Commission officer who has been working tirelessly for months with us through the ups and downs of trying to get a canoe in the flotilla. 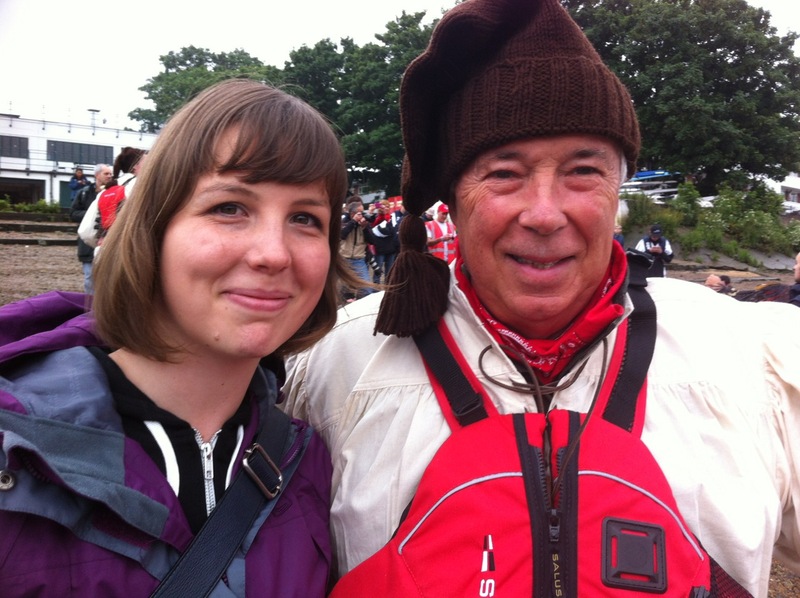 Here’s Dominique with Canada One/Un brigade member and CCM board member, Terry Guest. 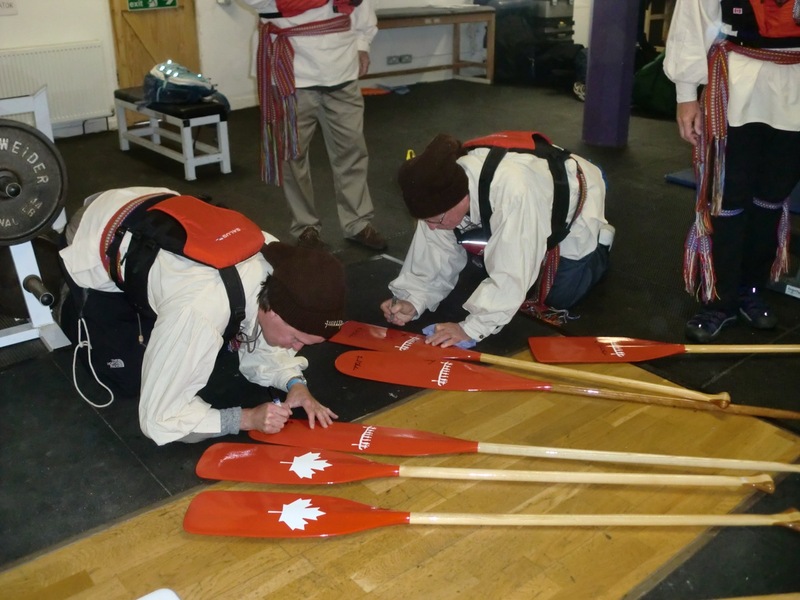 Meanwhile in the gymnasium of the ULBC, we dried off the newly painted and monogrammed Canada One/Un paddles and signed them all, so that we may use them for fund-raising and special gifts purposes for the museum. The paddles have a white maple leaf on one side and the museum logo on the other … very handsome, like brigade member, Geordie Dalglish. 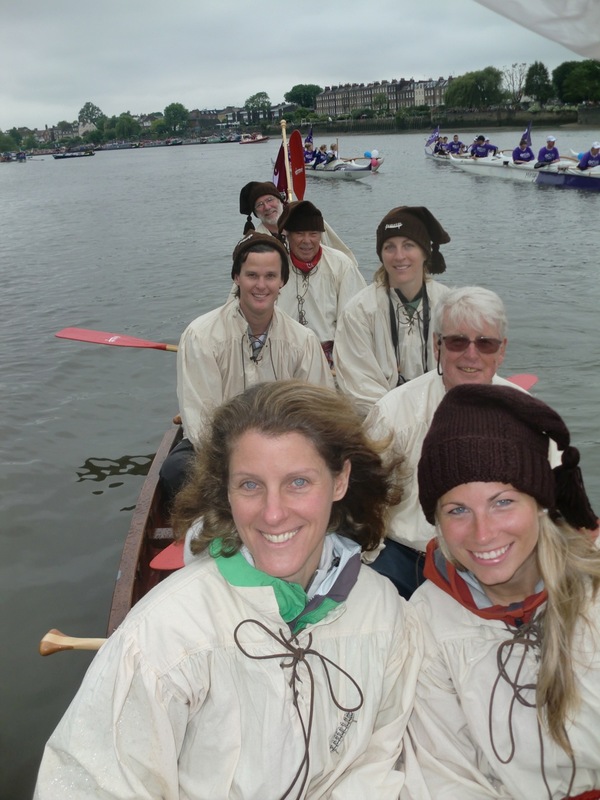 And then … the appointed time arrived and, for the first time ever as a crew, we embarked on the Thames. It was raining off and on as we started out from ULBC. Our outfit consisted of brown toque, bleached cotton chemise, ceinture fleshé and bright red pfd, which we adapted with just about all the clothing and waterproof layers we could fit under. It was important that we look smart for the pageant. But no sooner had we set off with all those layers on that we stopped and shed a few to cover several miles of river before reaching the mustering point. The reason why we started so far up river I really don’t know but it was quite a pull to get to where we needed to be, just upstream from Battersea Bridge, where the timed pageant was to begin. 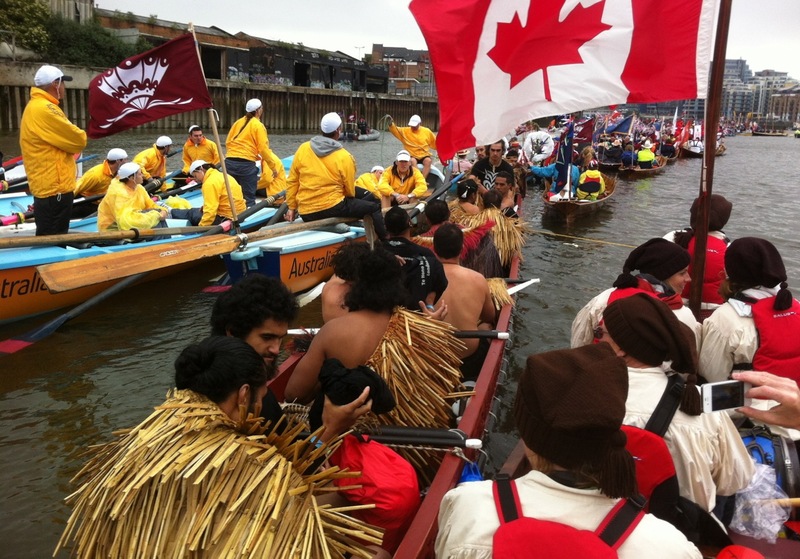 Most of the big paddled craft (not to be confused with large pulled craft, as in pulled with oars)—the wakka, the Hawaiian outrigger canoes, and Canada One started as far up the river as anyone. The good thing about that was that we watched the flotilla build as we passed other marinas and boating clubs where other human-powered vessels joined us. It wasn’t long before we started to feel as if we were into something b – i – g. Below from moving towards the stern in the boat: Melissa Murdoch and Laurel Raffan, Donald Ross, then Geordie Dalglish and Pilar Bauta, then Terry Guest and some guy we picked up in the Dog and Trombone Tavern the night before in the stern. The coolest thing about starting so high up on the river was that we actually passed most of the powered vessels of the pageant, moored on the side of the river, awaiting their turn to fall into line behind us. As we moved into this seething, belching (there were a number of steam powered), cheering, maneuvering sea of vessels, the sense of occasion doubled and redoubled with each reach of the river. At the mustering point, the idea was to catch onto several hundred metres of moorings in the order we were listed on the pageant schematic. We sidled up to our New Zealand friends and beside the Australian surf rescue craft, who were scheduled to be just ahead of us in the Human-Powered Squadron. And there we sat for nearly an hour, as the powered craft maneuvered into their positions at their mustering stations. With a fresh breeze and light rain falling periodically, it didn’t take long to cool off and it wasn’t long before the Canada One/Un Brigade was all dressed again in everything we’d brought with us. The Maori chaps were not so fortunate. To be as traditional as possible, they were to paddle bare-chested, capped only with their fibrous rain capes around their shoulders. They were cold but not one complained. 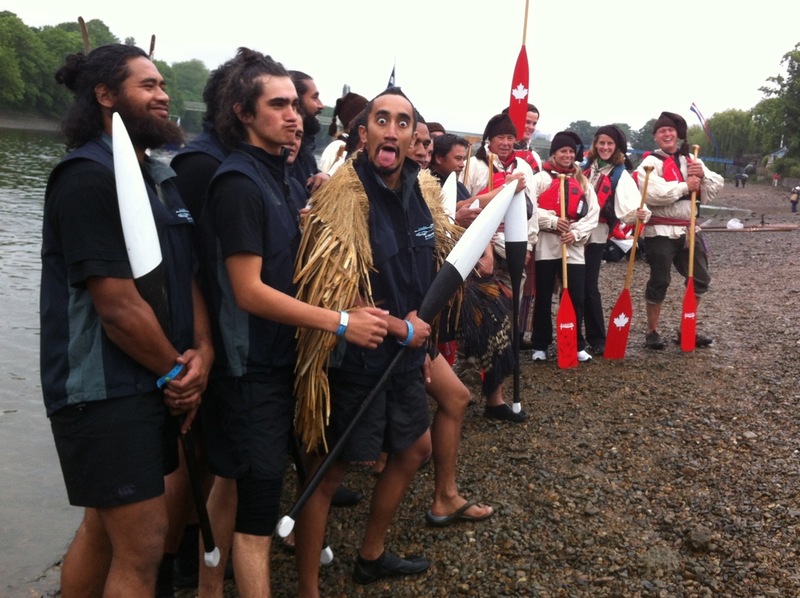 Tradition dictates that the Maori are not allowed to eat in the canoe and so it was a bit awkward as we mowed down on a hamper of goodies from Selfridges that Geordie had brought along, while our New Zealand brethren sat right next to us. And then … a steam train chugged over Battersea Bridge and we were off. In the front of the line was … well … we couldn’t see the front of the line but we could hear the carillon of bells on the lead vessel. And with surprising dexterity and precision, the entire Human-Powered Squadron fell into line more or less as it was supposed to. The flotilla was orderly … for a while. 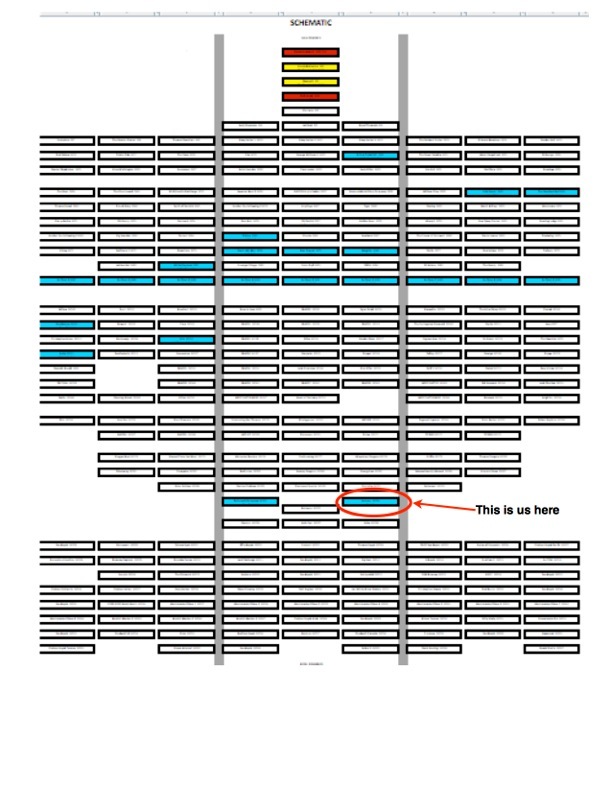 We were more or less in order until the Battersea Road Bridge. But just downstream from that was the Albert Bridge. And just below that, on the North side of the river was the Spirit of Chartwell which was moored to allow Her Majesty and other members of the Royal Family to review the Human powered Squadron before letting go and leading the powered squadrons down the river behind us. Unfortunately, at Albert Bridge, participants slowed, some even stopped to take photographs and this causes a bunch up that started to get quite uncomfortable. Behind Canada One/Un and the Wakka were the Hawaiian outrigger canoes and behind them were a host of single and double sea kayaks who, like the rest of us, were instructed to keep order and stay in line. Instead of doing that at the Albert Bridge bunch up, many of the kayakers opted to take advantage of their small size and maneuverability to power up through the larger craft and infiltrate the ranks of the bigger pulling boats ahead. The upshot of this was a madhouse below Albert Bridge. It was all we could do to stop from ramming into boats ahead and boats on either side, with these kayaks pushing through in what little space there was to maneuver, but we did get a quick glimpse of Her Majesty. And what a total thrill that was!!! The Human-Powered Squadron Plan was not to salute the Queen with our paddles individually, rather to all paddle or row past and then, en masse, on verbal instructions from the Commodore, Malcolm Knight, via the marshals in the powered safety boats that were traveling with us, we were to collectively “toss oars” or put our paddles in the air to salute the Queen. Unfortunately, because of the mix up and bottle neck caused by people choosing not to follow instructions, we never did salute Her Majesty, which was too bad. By then, as well, the wind was rushing and that combined with the growing roar of the crowds on the river bank, on the bridge, and on every available perch and balcony within sight of the river, made the verbal instruction plan virtually useless. Whether her Majesty knew any of this is probably moot at this point because she waved and pointed quite happily as this chaotic clot of happy rowers and paddlers clacked, hacked and clamored their way past the Spirit of Chartwell, with individual kayakers, who have chosen to break rank, buzzing around like bees tending a herbaceous border on a sunny afternoon, seemingly oblivious to the mayhem they have helped to cause. Concentrating on reforming our order and moving on down the river without further incident was all we could do at this point and by and by things settled down and we began to appreciate the throngs who had come to witness this spectacle. Once past Her Majesty, we were free to “toss oars” as often as we liked. Jeremy Ward, our avant, was in charge of initiating these voyageur salutes but from the moment we came below Albert Bridge, the roar of the crowd was so loud that no one, except perhaps Laurel and Melissa, who were directly behind Jeremy in the bow seat, could hear a word he said. And, when there were tall buildings close to the river that roar became almost deafening. 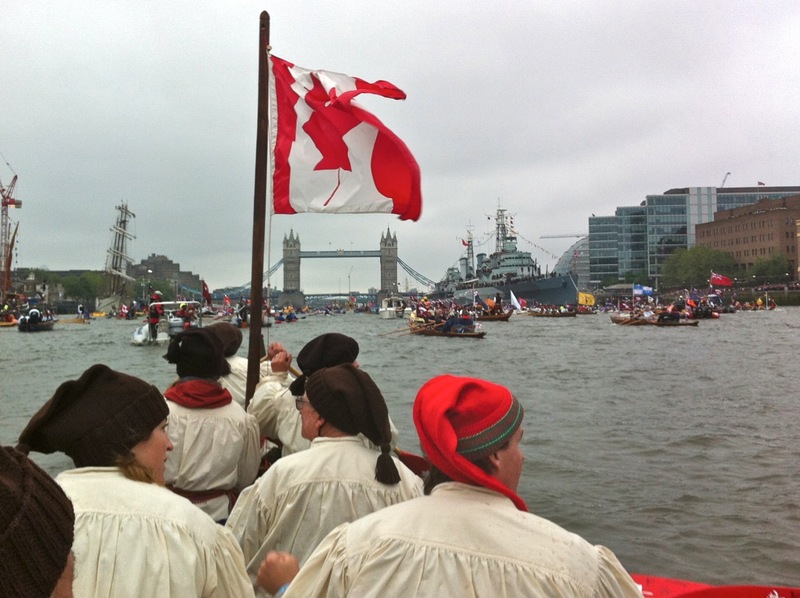 In no time at all, the miscues at Albert Bridge were replaced by awe at the scope and intensity of public affection for the Queen’s sixty years on the throne as reflected in the waves and cheers and calls of “Hey Canada” or “Hey New Zealand” as we paddled on by. 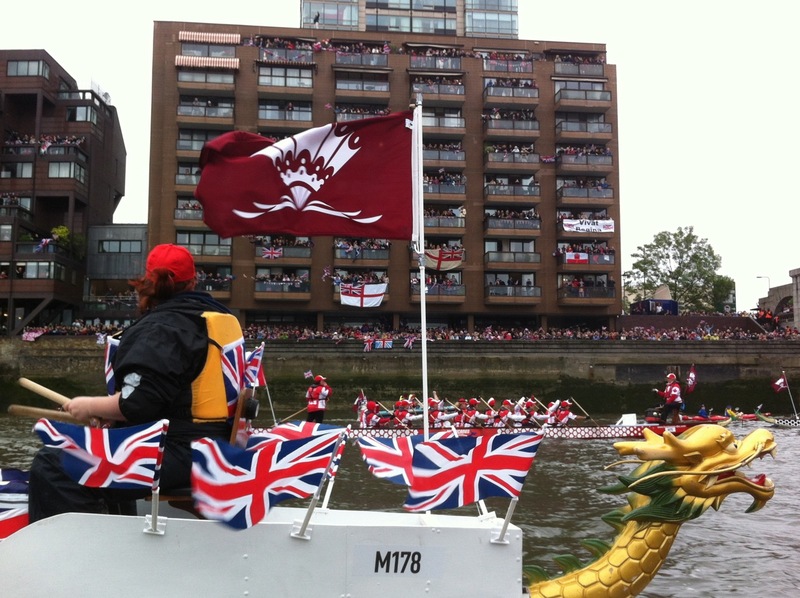 There’s much more to be said about the experience of being on the Thames for this event. I’m sure it was different for every vessel and for every individual participant. It was moving. It was at times frightening. It was chaotic. It was everything but a chore to witness more that a million people coming together in relative peace and harmony to mark an historic anniversary. By prior arrangement, and with Terry Guest taking the helm momentarily, I dug out my cheap-and-cheerful UK mobile on approach to Blackfriar’s Bridge and to my utter surprise and amazement was able to take a call and actually have a conversation with Peter Mansbridge who was with the CBC team describing the pageant from a vantage point high above the river. I could barely hear him and had to guess from fragments of speech I could discern over the din of the crowd and the rush of the river. Just a few seconds into the call, Jeremy yelled that we were about to crash into a pulling boat maneuvering to avoid a collision with one of the Blackfriars bridge abutments and we had to make a very hasty course correction. With really only one hand on the steering shaft, I very nearly dropped the phone into the river as we reefed on our paddles to avoid disaster. (Probably should have had a hands-free device) Anyway, it was a great to share the joy and the immediacy of the moment. More to come about the tumultuous conclusion of the pageant.